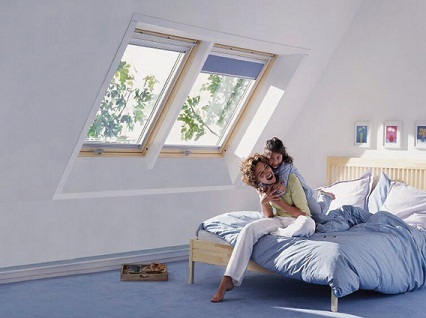 VELUX roof windows are designed for in-reach applications that require egress emergency escape capabilities. You can use these above-garage bonus rooms, lofts, and finished attic spaces. The ultimate daylighting experience is the GDL CABRIO™ balcony roof window, opens to create a roof balcony. It transforms unused attics or above-garage bonus rooms into extraordinary living space that embraces the best of the outdoors. Velux GPU MK08 Roof Window - 31 1/2" x 55 1/2"
Velux GPU SK06 Roof Window - 45 1/4" x 46 7/8"